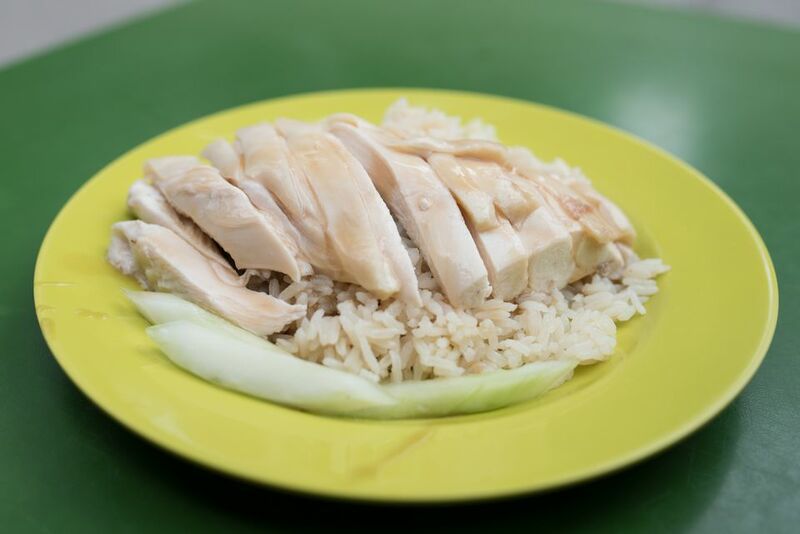 Considered one of Singapore's national dishes, Hainanese chicken rice traces its roots to the Chinese immigrants who came from the Hainan province and settled in different parts of what is now Southeast Asia. Although often associated with Singapore, Hainanese chicken rice is also found in the cuisines of Thailand, Malaysia, and Vietnam. By tradition, Hainanese chicken rice consists of four elements: the chicken, the rice cooked in chicken broth, the broth served as a soup, and the dipping sauce or sauces. Each element is crucial to a delicious and true representation of this dish. Note: while there are multiple steps to this recipe, this chicken dish is broken down into workable categories to help you better plan for preparation and cooking. Rub the chicken all over with rock salt to remove impurities. Do this two to three times until you see that the skin is clean. Place the chicken in a pot deep enough to allow the chicken to be submerged in the cooking liquid. Pour in the rice wine and enough chicken broth so that there is at least an inch of liquid above the chicken. Bring to a boil, skimming off any scum that rises; then lower the heat so that the liquid is barely simmering. Add the shallots, garlic, ginger, lemongrass, peppercorns, and salt, if the broth is unsalted. Cover the pot and let the chicken poach—about 45 minutes. When the poaching time is finished, turn off the heat but leave the chicken in the pot, still covered, for another 10 minutes. Using kitchen tongs, lift the chicken out of the broth. The best way to not break the skin is to insert one arm of the tongs into the cavity of the chicken. Meanwhile, strain the broth and measure 3 cups broth to cook the rice in. Let the broth cool. In a medium to large pot, add the cold broth to the rice and bring the mixture to a boil. Then cover tightly, reduce the heat, and simmer for 15 minutes, until the liquid is absorbed. Keep the cover on the pan, remove the pan from the heat, and let the rice stand for another 15 minutes to steam. Mix together the grated ginger, chopped scallions, peanut oil, and enough salt to taste. Transfer the chicken to a chopping board. It will have to be chopped through the bones so you'll need a heavy knife for the job. Find the joint that connects the thigh (not the leg) from the back and carefully cut through the joint, leaving the leg attached to the thigh. Do the same for the other leg and thigh. Find the joints that connect the "little drumsticks" (drummettes) from the breast and cut through the joints to separate both wings from the breast. Set aside the thighs and wings. Cut through the breast meat. Then chop all the way through to cut the chicken into halves. Lay the first half flat on the chopping board. Slice the meat at 1-inch intervals. Chop through the bones right where you have sliced the meat. Do the same for the thighs and wings. This is now the part when you can tell if you cooked your Hainanese chicken correctly. When you cut through the thigh bone, check the color—the center should be pink. If it is gray, the chicken is overcooked. Pile the chicken slices on a platter. Serve with the chicken rice, remaining broth, and dipping sauces. Poaching means the liquid should be below simmering point. Poaching time should be based on the weight of the chicken—30 minutes per 2 pounds. Hence, a bird weighing 3 1/2 pounds requires a poaching time of 45 minutes. Hainanese chicken is usually served with three sauces: chili sauce (like Sriracha), hoisin sauce, and a homemade ginger scallion sauce. The cooking time indicated says an 1:20, but Hainanese chicken rice can't be served right after cooking. The chicken has to be cooled completely before it is chopped; otherwise, the juices will flow out leaving the chicken meat, especially the breast, dry. Think of roast beef which needs plenty of resting time before it is sliced. The same principle applies to Hainanese chicken. Time is essential to allow to juices to settle so that they remain where they should—in the meat—rather than on your plate.